Have you ever gone to a progressive dinner? First you have appetizers at one person’s house, then when the timer’s up you pack up and drive to the next house, then the next house, then finally — several hours and houses later: dessert. It’s fun — once. But we do that with our websites all the time. Go here to watch my time-lapse vimeo from Joshua Tree. Go there to watch my interview on Google Hangout. Go somewhere else to read my blog. Here, there, and everywhere. Videos are the worst pain point for content creators. For ease of use and site speed, we host them on YouTube or Vimeo, and that’s good. That should happen. Because YouTube is the second largest search engine, we ask people to subscribe to our channel and rely on YouTube notifying them of new videos. That’s convenient for site owners because they don’t have to build that functionality. But what about the users’ experience with your content? You can have salad at my house, but the main course is across town. From a marketing standpoint, all traffic should point users to our website. If that sounds cold and calculated to you, think of it this way instead: What if your website was a simple place to host ALL your content for your audience? Sounds like hospitality to me. Sounds like hosting a 7 course meal at your home instead of having guests carpool to 5 locations and end up grumpy and exhausted. FooVideo is a FooGallery extension (see my previous post on how awesome FooGallery is). With FooVideo, you can easily create a gallery and adjust sizes and copy the shortcode into any page. You can even import a whole Vimeo or YouTube playlist. Boom. Done. 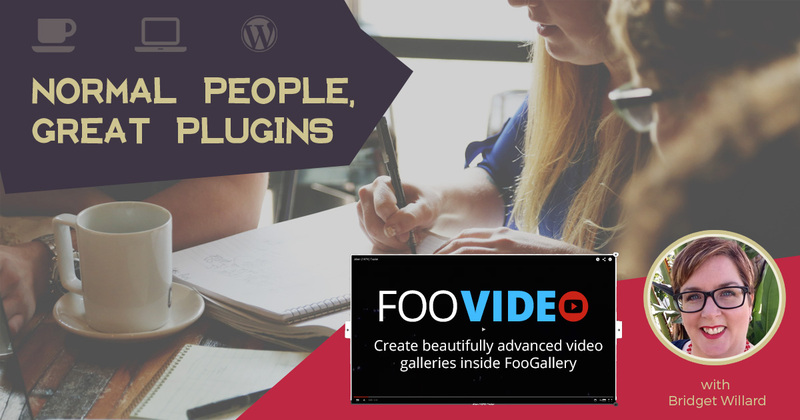 A user will see your video thumbnails because they’re added to the WordPress Media Library. You can even edit the titles and captions right there. You can decide to turn auto-play on or off. Then the magic happens: Click on the thumbnail and — if you’re using the FooBox lightbox — the video will open right on your page. The lightbox allows users to navigate through your videos, too. On my Bio page, I made three different galleries. One for presentations, one for video appearances, and one for interviews. I loved being able to size the thumbnails in each of the galleries to my preference. Another series this was perfect for was my Guru Minute series. 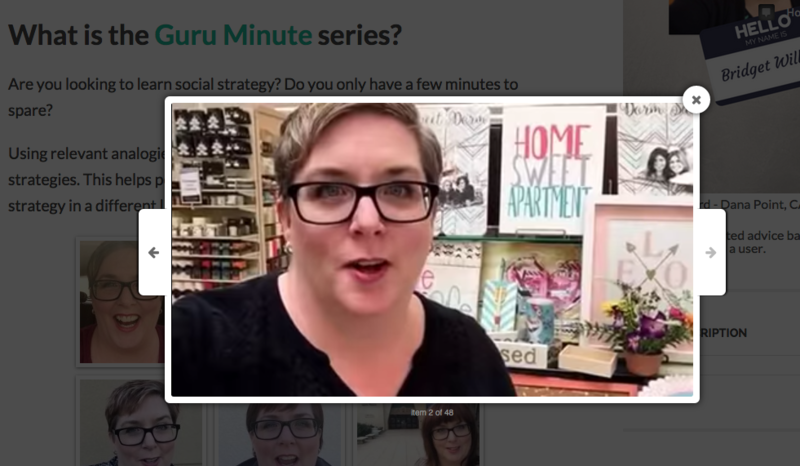 Several of my loyal readers had no idea I had this video series at all until I used FooVideo to make the Guru Minute landing page on my site. It’s like they never would have gotten the dessert because they didn’t know which house to go to! First, make sure you’ve got FooGallery installed, and FooBox Image Lightbox (they also have Pro version which is worth it too). Premium (paid) plugins are installed a bit differently than plugins in the repo. Give has a nice tutorial that’s specific to their premium plugins (called Addons), but is still a good overview of installing premium plugins that’s worth reading if you need a refresher. So for FooVideo, head over to their product page, click “buy”, purchase it, and download the zip file. Once the zip file is downloaded go back to the add plugin section of your WordPress dashboard and add a new plugin. It seems weird to add a new plugin when this is an extension to a plugin but this is how you do it. Trust me. I struggled with it. Learn from my mistakes. So, back to plugins. Add New. Upload Plugin. Find the zip file you just downloaded. Be sure to activate. You’ll need to enter the license key they emailed you in the FooGallery settings. Be sure to save. When you go back to FooGallery Extensions you should see FooVideo as purchased and active. At this point you can choose options as you normally would in a photo gallery. If you want the captions and descriptions to show, use the Simple Portfolio template. Publish the gallery and copy the short code into any page or post. Now people can come directly to your website, watch videos without leaving, and — fingers crossed — watch more. Another great example is the Give 101 page. There you can navigate each introductory video right on the page using FooVideo. It’s like having a mini online course for Give right on their site. Nice! We want people to spend time on our sites, right? So make them some coffee, fluff the pillows, and serve them dinner right there. They shouldn’t ever have to leave. Host your videos on your site and avoid “progressive dinner syndrome” by using FooVideo instead.